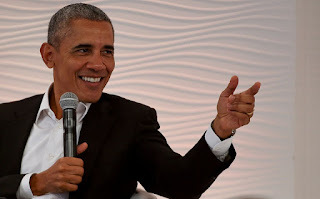 Former US president Barack Obama said Friday that social media powers like Facebook, WhatsApp and Twitter are leading to "snap judgements to complex issues" and warned leaders to think before tweeting. Obama was repeatedly asked about his successor, President Donald Trump, at a New Delhi symposium but stuck to a general warning to all high-profile figures to take care. "I think it's important to be mindful of both the power of these tools but also its limits," Obama said when asked about the dangers of Twitter, a platform on which Trump has caused repeat controversies. "What I would say is Twitter, Facebook, WhatsApp, all these various platforms are extraordinarily powerful tools, and those tools can be used for good and they tools can be used for ill," he said. Highlighting how he has 100 million Twitter followers -- "more than other people who use it more often" -- Obama said: "I think it's important to be mindful of both the power of these tools but also its limits." Obama's wife Michelle recently took what was seen as a subtle swipe at Trump, asking the audience at an event to spellcheck and not tweet everything that comes into their mind. "I think she was just giving a general advice, the same advice that you used to hear from your mother generally ... don't say the first thing that pops in your head," the two-term leader told the conference, which was organised by the Hindustan Times newspaper. "Your mother and father knew better. Listen to them. Don't do things like that. Think before you speak, think before you tweet." Obama was more direct in criticising Trump's threat to leave the 2015 Paris climate accord on slashing global carbon emissions. Obama would not be drawn into other questions about the US administration at the appearance where he called "destructive populism" a threat to modern democracy. "The thing I love about America and I suspect the thing you love about India is just this cacophony of life and it throws up all kinds of variety," Obama said in response to one attempt to force a comment on Trump. "There are political trends in American that I don't agree with and abide by but I recognise as part of a running thread in American life." Obama said he has become "obsessed" with the way news is handled and consumed, particularly by the young. "We are more connected than ever before but ... more and more we are fitting facts to suit our opinions rather than formulating our opinions based on facts," said Obama, who was in China before visiting India, and next goes to Paris.